Great work bringing this to the attention of more people Matt, I for one am extremely disturbed by what is happening in congress. I wish government would leave the internet alone! It annoys me when you hear actors complaining about there wont be enough money to make movies etc, all while making 30 million dollars for appearing in each movie. This bill must go on every nation, for the protection and integrity of everyone that goes to the internet, security must come first. And as the hackers goes on much higher technologies, it is not really tough to the hackers to check us personally, like what happen on Facebook. This is great and all, however I think we all need to take action to ensure theese kind of attacks on the internet at all, as google is well aware of, censorship of this kind is prominent all over the world already, although we are mostly spared ni the western world. As an actor dependent on a free and open internet, I believe google would benefit greatly from taking an active part in initiatives that are decentralising the DNS-system, for example dot bit(based on the bit-coin technology) and .p2p, an initiative from the spokesperson of the piratebay. Google could support theese inititives greatly with technical competences, credability, proposing standards and supporting them in chrome and android. Apart from making the world a better more transparent place. This in return would make many of your products (most prominently your search) more useful and valuebal in countries with censoring and repressing regimes. Sorry for bad spelling, English is not my native lanugage. If Congress passes SOPA I say we all get robo-caller software for our computers and start calling them. Paralyze the congressional switchboard, and the office phones of any politician that votes for it. I’m glad you pointed out the money from lobbying. I have a blog post saved as a draft that points out how much money the sponsors got from the content industry. Hard times for liberty. In Spain we have had a terrible cut down in liberty and freedom of speach with a law called Sinde’s Law that gives politicians the right to close websites at their sole discretion. This guy’s got a really good point, and one I think most of the anti-censorship crowd is ignoring. The simple fact is that censorship in some form or fashion has to occur. The goal should always be to keep censorship as minimal as possible, but sometimes it’s necessary. Everyone here, especially you, Matt, believes in a form of it. Example? Spam. Whatever the form of spam may be (email spam, forum spam, blog spam, webspam, etc.) anyone who either has an email account or has access to a site of any sort that has some level of public human interaction (e.g. a forum, a blog) doesn’t want spammy messages infiltrating his/her product. They may implement swear or other filters, but those filters represent a form of censorship. A thoroughly understandable form of censorship, and one we should keep in mind, but a form of censorship nonetheless. The only reason no one has dropped that card is because of the emotional backlash and irrational responses it could generate. The problem in this case is that government is proposing something. Government shouldn’t interfere with anything because it’s long since proven that it can’t handle any real responsibility or common sense thinking, but in this case I think people are overreacting far more than the government is overreaching. To compound the problem, people are overreacting without thinking of a sane, logical alternative. People propose silly ideas like this one, instead. If you’re going to complain about it, what are you prepared to do in order to provide an alternative that will be accepted? Obviously, status quo isn’t going to work because that’s what got us here in the first place. So what is the alternative? A partnership between government and all major service providers to work on the issue of copyright (probably even more dangerous since corporate interests would be at work here)? A public censorship repository? This is why I’m not taking part in this. No one’s proposing an alternative that makes any real sense. Everyone’s reacting emotionally, with bias, and without logic. Thanks so much for posting the link for those of us outside the USA Matt. It is way too scary to think of the really bad decisions that could be made by lawmakers with little or no understanding of real consequences. Thanks also for taking a stand on this and speaking out about it. I was wondering when all this would show up….well here we are…”they will go as far as we let them”….that’s clear. The US music and entertainment industry has already been paying lobbyists in other countries to help enact laws making it easier to sue down loaders. This has been happening in Australia and New Zealand where they have dubbed it “Skynet”. Beautiful sentiment and one which I hope holds true, but it doesn’t necessarily follow that just because you grew up surrounded by something and enjoying its benefits that you’ll automatically fight to protect it. Our planet being a case in point. Keep fighting the good fight Matt. I wrote my Congressman for the first time ever last week to explain why he should be in favor of SOPA. The purpose of copyright protection is to encourage people like myself, who are willing to work without a salary creating new works (books in my case) to believe that if those works find favor with the public, we’ll have a chance to earn a living. I’ve spent hundreds of hours this year filing DMCA complaints, disproportionately with Google’s Blogger, after sites that copied pages from my website began appearing above me in search. Matt, I’m a professional author, I’m always thinking about my readers, but the last thing I’m going to do is create new content when copyright infringement has destroyed my business model of being the good guy who gives freely of his time and work. As the note above implies, the guy didn’t even realize I have books for sale – that’s because there’s no pop-ups, forced sign-ins, etc. It’s funny, before Google set out to improve the quality of the web last February, I never had a problem with copyright infringements appearing above my own pages in search. Seeing Google sending people to piracy sites for title searches on my books before my own site brought home to me what Google believes search quality is, doing whatever makes the kids happy. Where do you expect the quality web pages to come from in the future? You’re setting up the world for an Internet that will consist of nothing but product reviews, opinions, and propaganda. All the real work will disappear behind firewalls and DRM. The one thing I’ll give Google credit for this year is belatedly adding the DMCA Dashboard to Webmaster Tools accounts. Back in February, confronted with tens of thousands of copyright infringements on my pages, I put a few weeks into DMCA filings and gave up. Now I can spend a day in DMCA Dashboard and get hundreds of infringements removed in 24 hours, as opposed to the 30 days or longer it used to take just to get a snarky response. I assume from the time stamps that the reason for the improved service is that legal work has been outsourced to India. Google likes telling people to examine their websites, as if we didn’t already know what was there, and confess our sins. Well, as somebody who has been supporting the Internet community for more years than Google has existed, let me suggest that you examine your own sins. And remember, without copyright protection, Google never would have had an Internet to index to start with, because it would have been nothing but photographs, and you know what kind. I’m from another country, but the government here is trying to put it’s nose into internet as well. that’s totally not cool! I agree Baruch, with all the problems going on right now the government could and should concentrate on more pressing issues. @Gerry Ronson so its ok if I make you work for peanuts then? films remeber tv shows cost a a lot to make and 99% of actors don’t earn much. The scale rate for a featured actor in a tv show is about what I make and I am in no way at the top 1 or 2 % of my industry – which is what a lead actor in a network TV show is. It’s really sad how such an overgrown corporate industry fights to not only make more money, despite their billions their already sucking in, but they are willing to ruin something everyone loves in the process. I can understand their point in some of it, such as sites like icefilms.info, but they’re not even wanting to get rid of the problem… they’re just wanting to create a way for themselves to make money on the problem. There are lakh of post and comments how we can moderate all? The last few years I was thinking about a new internet network, based on the same infrastructure but using only VPNs, so all of that problems will be “outside” of it. I share the same pain with Morris Rosenthal. The company I work for has lost 90% of our revenue (from $20 million in 2006 to now less the $4 million in 2011) due to our content being pirated and offered for free all over the Internet. 99% of these sites that host and allow the download of our created content are out of the country. Nothing I can do about it. When I do a search for our content in Google, those pirated sites come up before ours. Something has to be done about this. I have filed tons of DMCA complaints, only to be ignored. Those oppose to SOPA say it will destroy innovation. Stealing someone’s hard created content and posting it illegally is innovation? It is theft! Those oppose to SOPA say it will kill jobs. Well, because of the pirated content, than Google and other search engines promote, we had to let go of over 60 employees over the last five years. I do not buy the SOPA will kill jobs B.S. for one second. If anything, allowing pirated content freely over the Internet and being promoted by search engines as killed jobs and destroyed families of those employees that have lost their jobs. I have seen it first hand. Something need to be done about this. 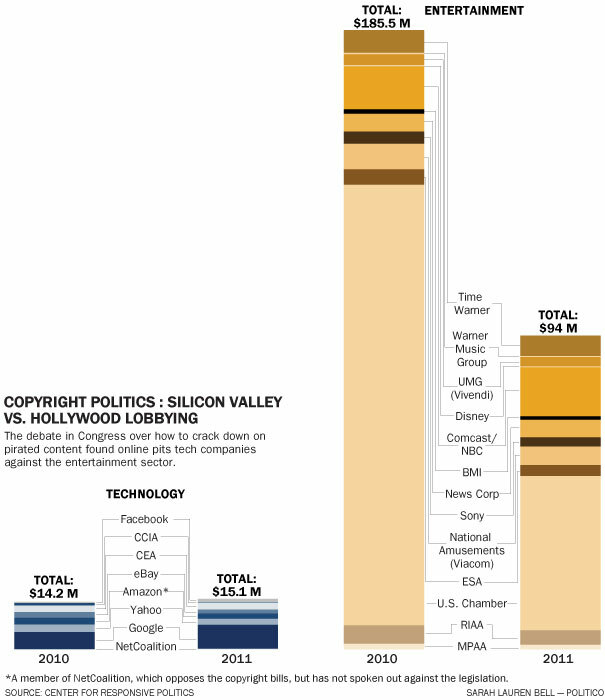 Those that are opposed to SOPA and Protect IP have not proposed a solution. OpenAct is not a solution, it is a joke. Politicians are finally realizing the power of Internet. In fact they are kind of scared to see such powerful tool in the citizen’s hands. Frankly, I don’t see any difference between people supporting SOPA, PIPA and Chinese government that gets into the bits and pieces of what people do and talk about. i think US always thought that they have the complete power. dont you think about india..
As an actor dependent on a free and open internet, I believe google would benefit greatly from taking an active part in initiatives that are decentralising the DNS-system, for example dot bit(based on the bit-coin technology) and .p2p, an initiative from the spokesperson of the piratebay. Google could support theese inititives greatly with technical competences, credability, proposing standards and supporting them in chrome and android. I hope so rashid. I agree with you..
this is really great, here is the time to show the power of “Internet”. ← I need your help–please. Call your congressperson?